Jewish Lights Publishing, 9781580236669, 288pp. "What really matters is that we care about the people we seek to engage. When we genuinely care about people, we will not only welcome them; we will listen to their stories, we will share ours, and we will join together to build a Jewish community that enriches our lives." Membership in Jewish organizations is down. Day school enrollment has peaked. Federation campaigns are flat. The fastest growing and second largest category of Jews is "Just Jewish." Young Jewish adults are unengaged and aging baby boomers are disengaging. Yet, in the era of Facebook, people crave face-to-face community. "It's all about relationships." With this simple, but profound idea, noted educator and community revitalization pioneer Dr. Ron Wolfson presents practical strategies and case studies to transform the old model of Jewish institutions into relational communities. 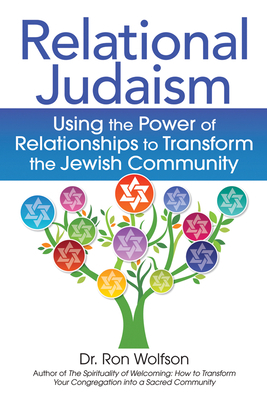 He sets out twelve principles of relational engagement to guide Jewish lay leaders, professionals and community members in transforming institutions into inspiring communities whose value-proposition is to engage people and connect them to Judaism and community in meaningful and lasting ways.